Promises Kept: The GB60 delivers more of what cruisers want. board while the boat is running?) 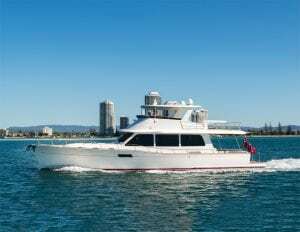 I have found that after dozens of sea trials, however, unless the ride also included a week of island hopping in The Bahamas or cruising Italy’s Amalfi Coast, it is difficult to recall details about a specific experience. 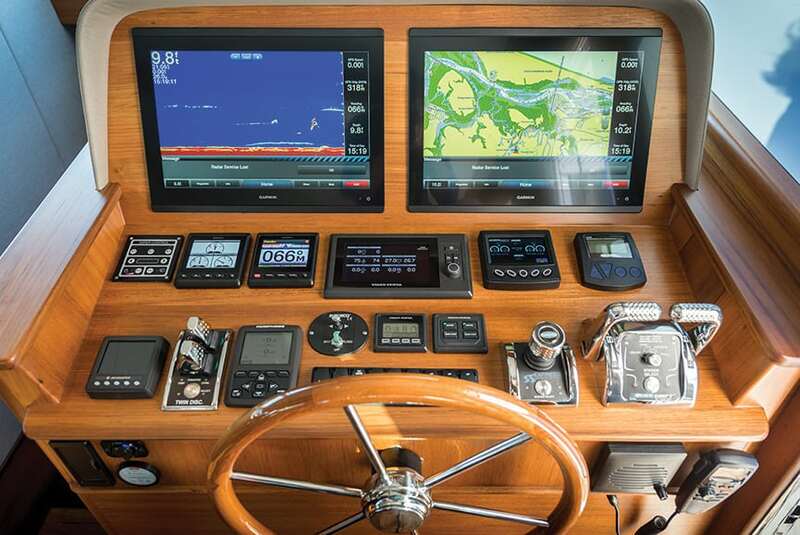 That being said, there are exceptions that occupy a sea-trial sweet spot in my memory bank. At the head of Palm Beach Motor Yachts is Mark Richards, a famed America’s Cup yachtsman and holder of multiple sailing records who applied his knowledge of high-performance sailing yacht design and materials for lightweight yet strong construction. 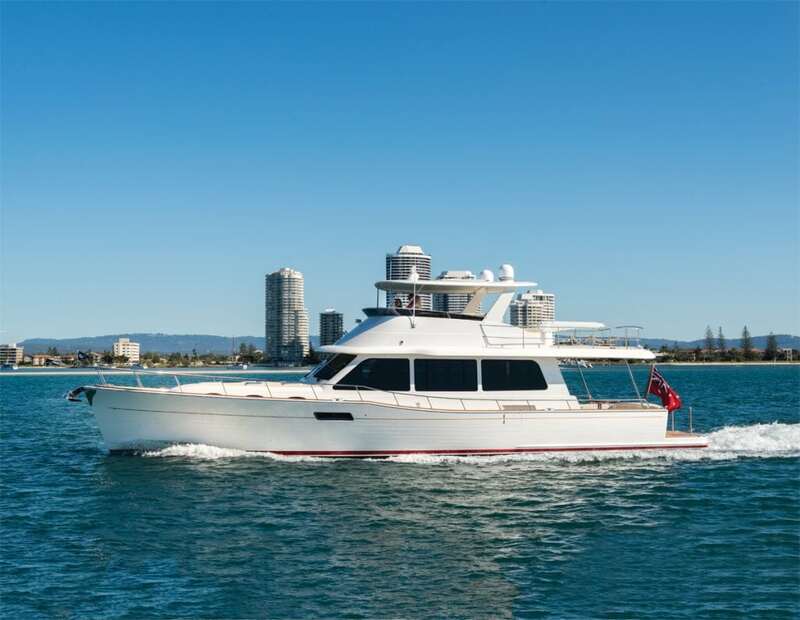 In 2014, Grand Banks Yachts acquired Palm Beach Yachts and named Richards to run both companies, with his promise to build high-quality, high-tech cruising boats under the Grand Banks brand. Richards kept his promise. 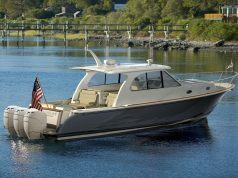 At the 2017 Newport Boat Show in September, Grand Banks debuted the first of its brand-new model series for long-distance cruising, the Grand Banks 60, which replaces the Aleutian series. 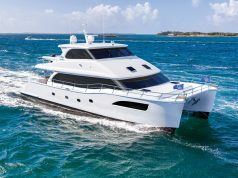 As evidenced by the sale of seven already, including orders for four at the Newport Show, buyers—and marine journalists—are impressed with this new series. 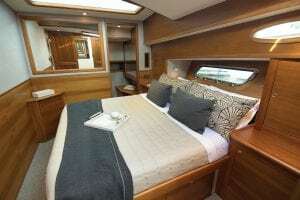 Even before we went out Port Everglades for my sea trial, I was impressed with the customized layout fashioned by the Canadian owners of GB60’s Hull #2. This is the sixth Grand Banks yacht for the experienced couple, who maintain a dock at Hilton Head and live aboard for about six months a year while cruising Florida and The Bahamas. 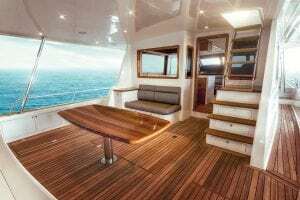 Entering the teak-walled salon from the aft deck up one step and through a bi-fold teak door, to starboard guests find twin facing settees and a glossy wood, adjustable table. The table raises or lowers for dining, drinks, board games, or for a laptop to send email to family and friends. 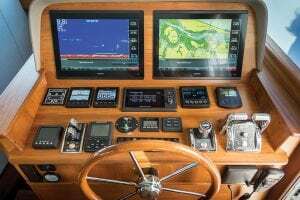 Also, a 42″ flatscreen TV is hidden in the cabinet wall beneath the starboard window. Opposite to port, instead of the standard L-shaped settee with coffee table, the owners opted for his-and-her comfy upholstered chairs, with a cabinet between that serves as a side table with storage. 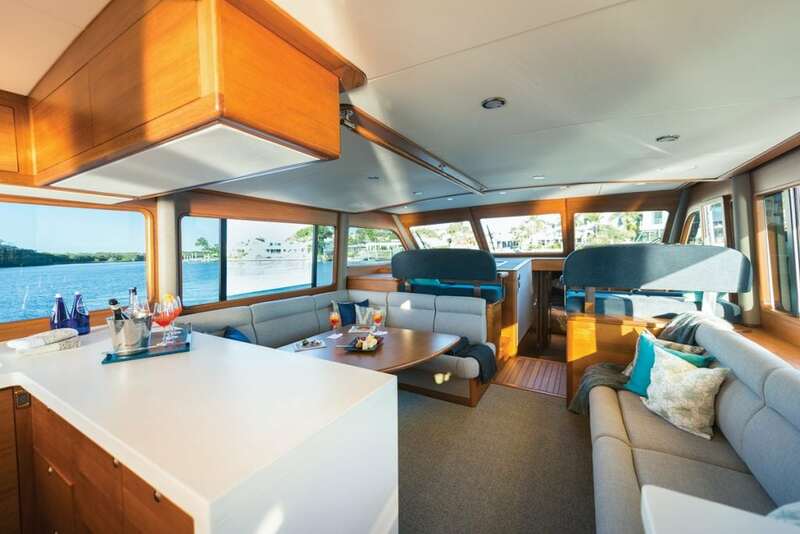 The U-shaped galley forward is well-equipped with a cooktop, convection oven, sink, Silestone countertops, and an overhead cabinet that cleverly lowers with a flip of a switch to conceal galley items. Large windows— dressed with simple but attractive curtains that make the room homey—are all around offering 360-degree visibility at the helm across from the galley forward of the settee. Owner ingenuity continues in the below-deck accommodations. The owners opted for a two-stateroom layout—master and forward VIP—instead of the standard three staterooms. They opted for double sinks in the master ensuite with a single toilet. Across the hall to starboard is a common shower, with a dayhead—single sink and toilet—for guests in the forward VIP queen to use. The third cabin space has been designed for a stacked washer/dryer behind the door and a large counter area for folding and ironing, while a little further aft and down a step an extra refrigerator and freezer provides room for extra provisions for long cruises to The Bahamas. The standard setup for this cabin is twin singles: one along the hull side and the other in the lower space along the aft wall. Exterior spaces in the GB60 are also smartly arranged. 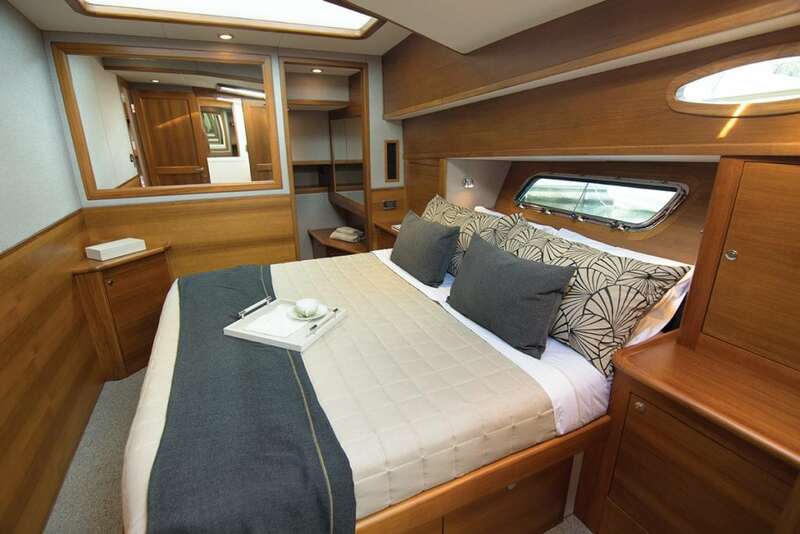 In the cockpit, the lower steps to the flybridge have small drawers for storage, then a ladder facilitates an unrestricted view aft from the inside helm.A bench settee across back with a glossy table in front provide for alfresco dining, preferably on perfectly grilled entrees courtesy of the barbecue mounted in a concealed compartment accessed from the swim platform. 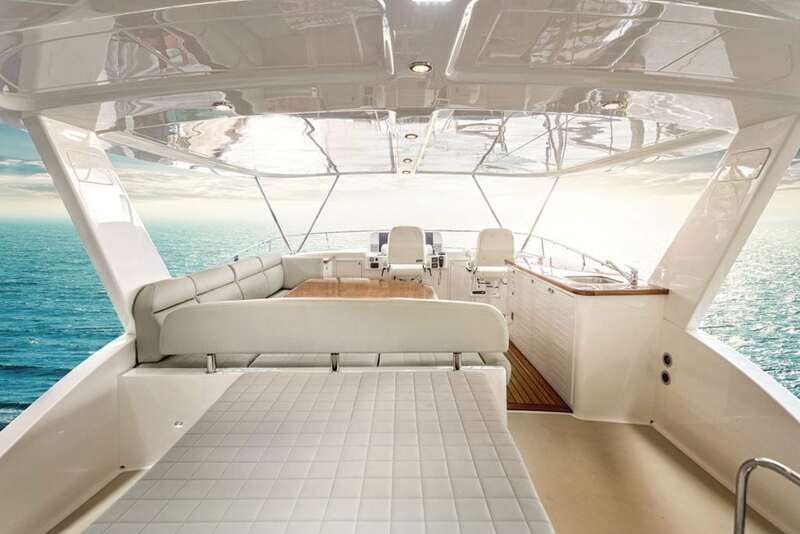 On the flybridge, a solid windshield as found on the skylounge model instead of clear marine vinyl provides protection from wind and spray but with the breezy openness of an open flybridge. Genius. An L-shaped bench with a large table give guests a great view while the skipper and mate navigate from dual Stidd chairs forward of a wet bar on the starboard side. There’s plenty of room for storing a RIB with davit.As we headed out Port Everglades, the captain powered up the twin Volvo IPS 1200S 900-horsepower diesel engines and there was little to no bow rise. The boat was solid in and out of the swell with no excessive slapping. We enjoyed the quiet ride as the GB60 climbed to a top speed of 36 knots, then the captain throttled back to a cruising speed of 27 knots. At that speed, the GB60 has a cruising range of 879 miles; back it down to 10 knots, and the GB60 can cruise for 2,555 miles. 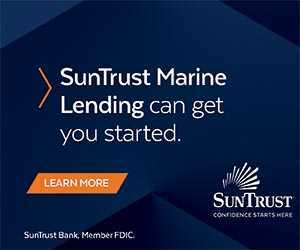 For convenience, diesel can be taken on from either the port or starboard side into the single 1,530-gallon fuel tank, so no fuel transferring is required. As we continued to cruise, the GB60’s ride reminded me of the sea trial I took seven years ago, hardly a surprise, since Richards incorporated the same style hull on the GB60. 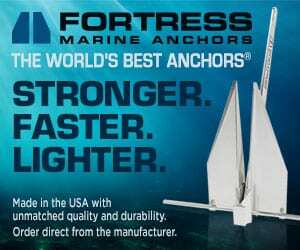 However, the GB60 is the first in a line of fully infused carbon fiber construction boats, resulting in a low center of gravity. This provides for stability at all speeds, and offers advantages in strength, rigidity, weight, and performance. In addition, a Seakeeper 9 stabilizer makes the GB60 just as comfortable at anchor, with little sway or roll. Richards did more than make good on his promise to build high-quality, high-tech cruising boats. By all accounts, the GB60 delivers more of what cruisers want, with astounding fuel economy to boot. And if you want all of it in a slightly smaller size, the GB52 is planned for delivery mid-2018.